Diagonal pliers (also known as diagonal cutters, diagonal cutting pliers & wire cutters) are designed to cut wire, rather than gripping or pulling. Their jaws are especially sharp and engineered to cut efficiently and closely (Wikipedia). A high leverage design means that you get a ton more cutting power out of them, especially compared to traditional rivet style pliers (Home Depot). Let's take a look at 5 of the best-selling diagonal cutting pliers for 2017 and see how they compare. The Stanley Diagonal Cutting Pliers 4.4 $ 6"
The Irwin Diagonal Cutting Pliers 4.6 $ 6"
The Apex Tool Diagonal Compound Action Pliers 4.4 $$ 9"
The iExcell Diagonal Wire Cutting Pliers 4.1 $ 4.5"
The Channellock Diagonal Cutting Pliers 4.8 $$ 7"
These diagonal cutting pliers offered by Stanley are well-constructed, handy and practical for hard to reach areas. Users love that the pliers cut quickly and effectively, but some do note that there is not spring and they have to open and close them manually. These 6-inch diagonal pliers measure 8.4” x 3” x 0.9”, and they have a forged-steel construction and a rust-resistant finish for protection. They feature a double-dipped handle for additional comfort, hardened cutting edges, machined jaws, and slip-resistant grips. The Stanley diagonal pliers meet or exceed ANSI standards. 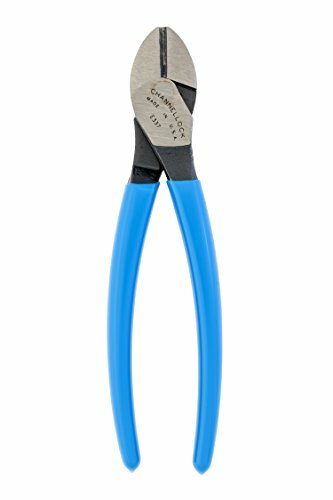 A buyer comments that these are the best pair of diagonal pliers that he has ever owned and that they cut both soft copper and heavy communication cable. The reviewer also adds that the rubber handle fits nicely in his hands and that he highly recommends them. A user shares that the wire cutters arrived quickly and in perfect condition and that the cutting edge is sharp, while the handle is comfortable to grip. Another customer mentions that he uses the Stanley diagonal pliers for cutting guitar string and they perform exceptionally. A happy purchaser says that these 6-inch cutters are still as good as new after several months of regular use. However, some customers have complained that the cutting pliers are not very sharp or that they get dull quickly. Some buyers also state that they are not suitable for thick wires. 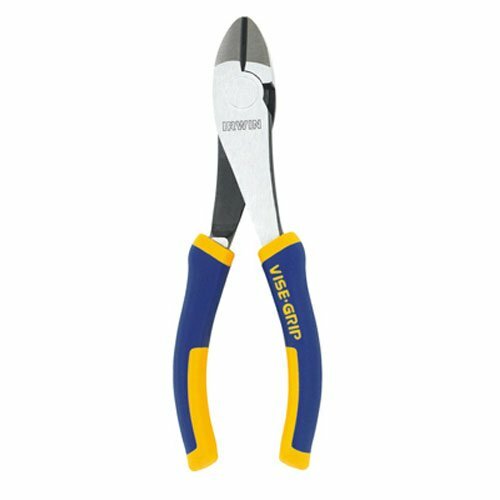 If you need high-quality diagonal cutting pliers, you might take a look at these 6-inch wire cutters offered by Irwin. Users love that the pliers are sharp, but some do note that they are smaller than they expected. These wire pliers measure 9” x 2.9” x 0.8”, and they have machined jaws that ensure maximum gripping strength. The cutting pliers feature a durable nickel steel design, ProTouch grips for comfort and for reducing hand fatigue, a weight of 8.8 ounces, and induction hardened cutting edges. The Irwin diagonal pliers meet or exceed ANSI specifications. As a whole, buyers are extremely satisfied with the sharpness, design and size of the Irwin diagonal wire cutters. A user shares that these 6-inch pliers are ideal for electric wires and that he only regrets not buying them sooner. Another customer adds that the pliers cut through a thin wire like it’s butter and that they are well-made and sturdy. He highly recommends them to anyone looking for the best diagonal cutting pliers. A satisfied user adds that the pliers don’t have any problems with zip ties and that they cut cleanly and quickly. However, some customers have complained that there is no spring and that the pliers could be sharper. Some users also note that the pliers are too tight. These diagonal compound pliers are expensive, well-designed and reliable. Users love the durable design, but some do note that these pliers are manufactured in China. The diagonal cutters measure 11” x 3” x 2”, and they have a chrome vanadium steel construction for durability. They also feature co-molded grips for comfort, a compound leverage design which increases cutting power by half and heat treated rivet. The 9-inch pliers also have induction hardened edges that guarantee sharpness, and they weigh only 4 ounces so that your hand won’t get tired quickly. Overall, these diagonal cutters are ideal if you want high-quality action pliers. A user comments that he uses these diagonal cutters for stainless steel piano wires and that they handle this job perfectly. The reviewer also adds that they are easy to squeeze and that they cut smoothly. A customer mentions that these pliers are a necessity for his fishing emergency kit and that they snip a fish hook with no issues. A satisfied purchaser shares that the cutting edges are sharp and that they cut through light metals and plastic effortlessly. The user also says that the jaws line up and that the grip is comfortable and doesn’t slide. However, some customers have complained that the diagonal pliers broke very quickly, even on the first cut. Some users also note that the rivets are poorly made and that the spring gets loose often. If you’re looking for reliable diagonal pliers for jewelry repair, you might consider these wire cutters offered by iExcell. Users love that the diagonal pliers cut smoothly, but some do note that they are not suitable for hardened materials. 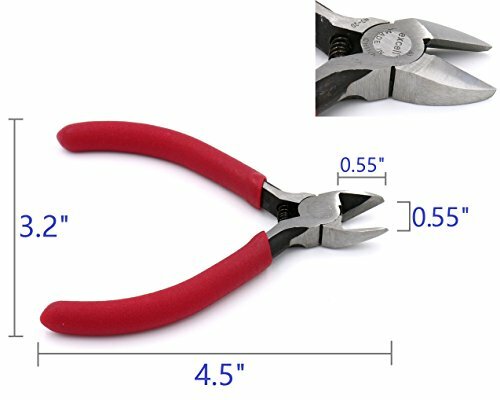 These wire cutting pliers measure 8” x 2.9” x 0.7”, and they are made of carbonized steel with a weight of 2.4 ounces. The maximum jaw width is 0.6 inches and they feature spring-loaded handles and an anti-slip covering for comfort. The cutting edges are treated with high-frequency thermal radiation, while the surface of the pliers is covered with rust-preventative oil. A purchaser comments that the cutting jaws line up perfectly and there is no gap present. The reviewer adds that he cuts zipping ties with no issues and that the cutters won’t have any problems with small wires. He also says that the handles fit nicely in his hand and that they don’t slide. A happy user mentions that the diagonal pliers are very sharp and that they cut with precision. He is very pleased with the achieved results and that he highly recommends them. However, some customers have complied that the pliers are not sharp enough and that the cutting edges are dull. Some users also note that if you try to cut any steel or stainless wire, you’re going to damage the edges. These 7-inch diagonal cutting pliers offered by Channellock are well-balanced, reliable and efficient for most types of wires. Users love that these wire cutters are made in the USA, but some do note that they are quite expensive. The pliers measure 7 x 2.1 x 0.5 inches, and they weigh only 0.3 ounces. They are made of high-carbon steel for improved performance, and they have an ultimate rust prevention finish coat. The Xtreme Leverage Technology design ensures that you need to apply less force to cut a wire than similar pliers and they also feature a lap joint. In general, users have a very high opinion regarding the Channellock diagonal pliers, and they don’t have any major complaints regarding their performance, and functionality. A buyer mentions that the Channellock pliers are dependable and that they could cut through both thin and thick wires with little effort. Another customer states that these are high-quality pliers and that he has been using them for months with excellent results. He highly recommends them to anyone looking for the best steel diagonal pliers. A purchaser says that these pliers are well-built and that he would consider buying another pair. A happy buyer comments that these wire cutters work better than he expected, but it’s awkward to use them in tight spots. The first diagonal cutting player we examined was the Stanley 6 inch plier. These Stanley diagonal pliers are constructed from forged-steel and have a rust-resistant finish designed to make them durable for extended use. Stanley says that the pliers' machined jaws are engineered to create a highly slip-resistant grip that you can use with their proprietary double-dipped handles. One buyer we interviewed says that they open very wide, and are equipped to cut things as heavy as communication cable, and also things as soft as copper wire. Another reviewer we interviewed says that the edges are particularly sharp and they also endorsed the grip, saying that its 'grippyp' coating makes it really easy to maintain a hold of when you use the pliers. 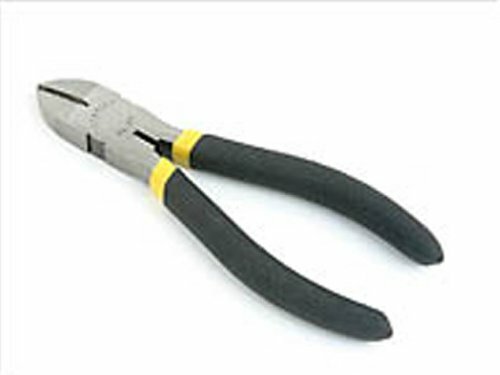 Another reviewer says that it in his electrical repair shop these diagonal cutting pliers are often referred to as 'snips'- and he says that they are a cheap and effective solution for his cutting & crimping needs. Another buyer says that the grip has worked well for different users and his family with different hand sizes- they are not too heavy and have withstood extended use doing indoor and outdoor home repair. Another buyer told us that he purchased this pair of Stanley diagonal cutting pliers because he was doing a lot of nail hammering, and whenever a nail became mangled and couldn't be pried out using the back crowbar of his hammer, he would use the diagonal cutting pliers to pry the nail out. The second option we examined was the Irwin Tools diagonal cutting pliers-these nickel chromium built pliers are engineered to decrease incidence of hand fatigue and the cutting edge is induction-hardened so that they stay sharp for a longer period of time. One electrician we spoke with says that these Irwin diagonal cutting pliers have become the go to wire cutter for any sort of on-the-job wire snipping, crimping and trimming they need to do. One carpenter told us that they purchased these diagonal wire cutting pliers to deal with some broken segments of fence- they were able to quickly cut the wire to length and mend their broken property fencing. Another Irwin Tools buyer who owns a farm says that he used a welder and these Irwin diagonal cutting pliers to craft a wire cage for his vegetables so that his farm animals wouldn't be able to eat them. The third diagonal compound pliers we examined was manufactured by the Apex Tool Group. These Chinese-made pliers are constructed from chrome vanadium steel. One electrician that we chatted with told us that they have been functional and effective pliers that have been able to deal with material as diverse as piano and copper wire. A fisherman we spoke with purchased these Apex compound action pliers to keep on board their Grady White fishing boat to snip fish hooks and to deal with fishhook injuries. Another reviewer we were able to get a hold of told us that they like to use compound action pliers because of the precision jaw alignment, the comfortable but sticky-gripping handle, the solid construction and their general ability to cut a variety of different cable ties and wiring. Other buyers say that while they work well for smaller gauge wires, you won't want to try to cut anything too thick with them because you could end up breaking the spring that keeps the wire cutters assembled. The fourth option we examined was the iExcell diagonal nipper repair tools. The manufacturers say that the spring-loaded pliers utilize a PVC covering to make them particularly grippy and comfortable for a variety of different wire-cutting uses. While many of the buyers we interviewed said that these were particularly sharp and functional anti-slip wire cutters, some buyers did say that what they received from the manufacturer was very junky. In particular, they criticized the cutting edges, which they told us were corroded and appeared constructed from an inferior style of steel. The last option we examined was the Channellock diagonal cutting pliers- Channellock says that these USA-made pliers are designed to be particularly lightweight and ergonomically sound to make them easy to handle in a variety of different challenging work environments. They are constructed from high-carbon C1080 steel and have a special coating to guard against rusting. 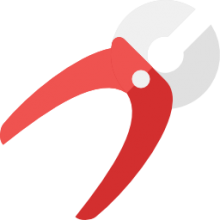 An electrician we spoke with says that he was pleasantly surprised by the ability of use Channellock pliers to work through a grueling home renovation, saying that for the various electrical tasks he had to undergo, these were an indispensable asset. Other buyers say that the Channellock blades are sharp- enabling you to cut through anything that you could fit in between its sizable jaws, within reason, of course.